Sometimes I think about maybe one day thinking about moving to Florida but who are we kidding? 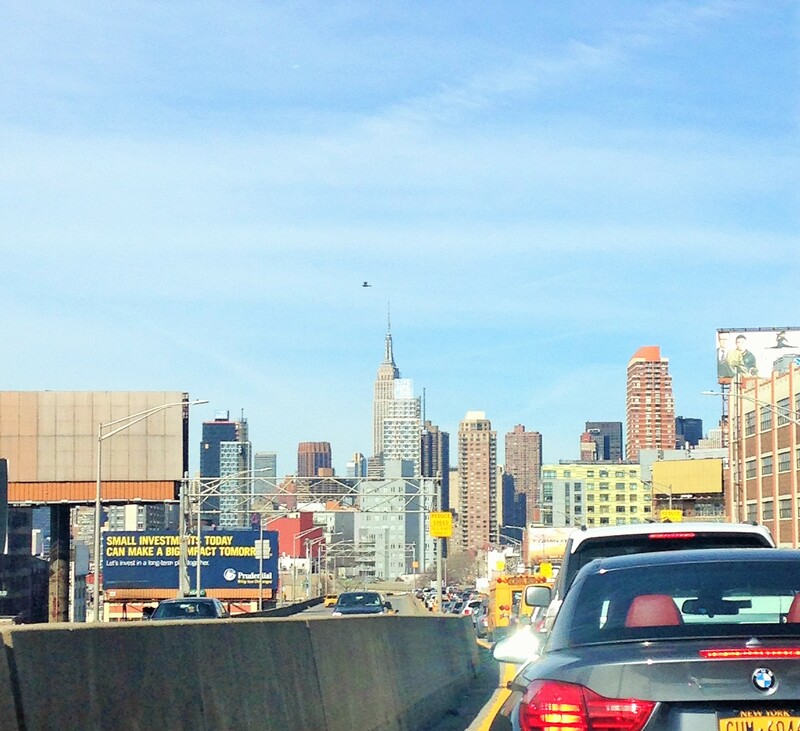 I love New York and doubt I will ever leave but the traffic? I could really do without the traffic. I spent way too much time in the car yesterday. It’s either wow look how fast I flew into the city or, like yesterday, it’s oh my goodness I am still in the car just staring at the tunnel and this is just not okay. I keep forgetting to ask if you heard that crispy m&m’s are making a comeback! Next to plain m&m’s, the crispy m&m’s were definitely my favorite during my early 2000’s m&m’s obsession so when I heard the big news about their return, my sweet tooth smiled. The crispy m&m’s originally came in the blue bags but now we will find them in the green bags since pretzel m&m’s took over the blue a few years ago. On the topic of crispy, it came to my attention that there’s a New York area restaurant, The Parlor, serving up a super interesting brussels sprouts dish which involves fried brussels sprouts, sriracha sauce and RICE KRISPIES. Click here for the article and recipe. Roasted brussels and rice krispies? I mean, okay, weird, but really the reviews have been terrific and I guess, how could it be bad? Just trust me okay? You eat peanut butter on your cold sesame noodles when you order Chinese Food and peanut butter is used in your satay this and that. It’s fascinating actually that I can crave peanut butter at each meal when I eat it all of the time, but yeah, I crave it. The other day I couldn’t decide between having a peanut butter sandwich and a vegetable loaded lunch bowl so I combined the flavors and created a winner. This recipe for peanut butter roasted brussels sprouts satisfies your peanut butter craving while giving you a dose of protein plus healthy fats at the same time as meeting your veggie requirement! Even better if you add roasted sweet potatoes. Peanut butter with sweet potatoes? Oh my, yes. Just yes. I am not the best at measuring when I cook and exact amounts really depend upon how many brussels sprouts you are roasting and how strong you want your flavors. I gave you basic amounts in tablespoons, assuming you roast a whole package (1 pound) of brussels sprouts but I really don’t think you can go wrong if all you do is eyeball it rather than measure. If you taste it and want to adjust the ingredients, you can always add more of any of the ingredients without really screwing anything up. If you do not have sweet chili sauce, I recommend that you add it to your grocery list for this weekend. I get mine at Trader Joe’s. Wash brussels sprouts, cut in half and then soften in the microwave (I use the fresh vegetable setting) for a few minutes. In a small bowl, mix together pure maple syrup, djion mustard, salt and pepper. Once brussels sprouts are softened, spritz them with coconut oil cooking spray and add them to the bowl to coat. Spread brussels sprouts on a lightly greased oven safe baking tray and bake for about 20 minutes (or until lightly golden and crispy). 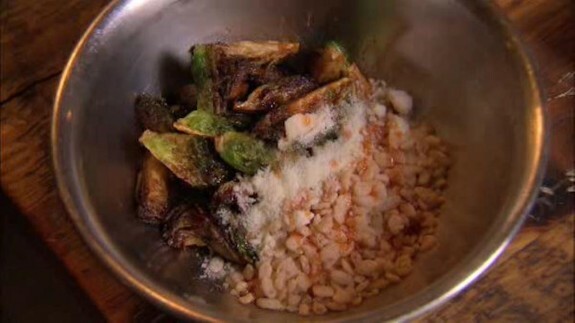 While brussels sprouts are cooking, mix together peanut butter and sweet chili sauce. 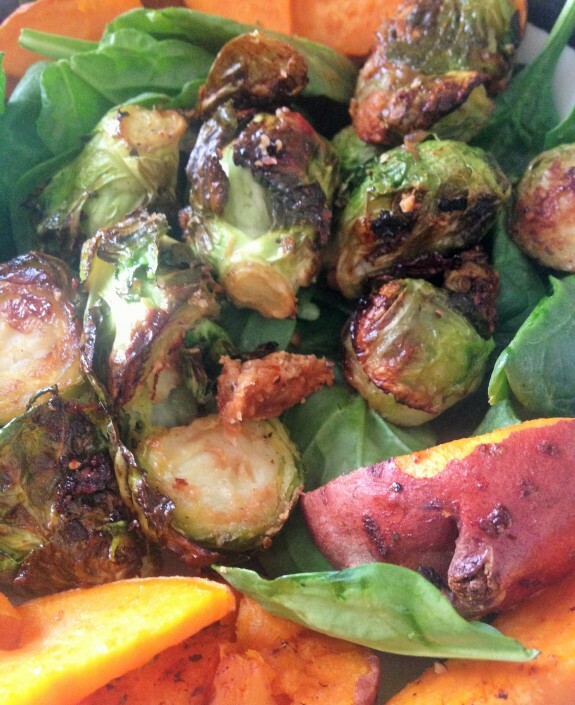 Remove brussels sprouts from oven and mix them in the peanut butter mixture. Oh, besides having no patience for New York traffic, I have even less patience for the snow that is expected later today. Isn’t it the first day of Spring?! Do you remember crispy m&m’s? Which m&m’s were your favorite? Is it snowing by you today too?! PB and Brussels sprouts? Yum!!! Two of my favorite things. Dijon is an interesting addition too. I’ll have to try this. I find that the Dijon mustard when warmed up, especially on the sprouts, takes on a neutral taste but gives great flavor (if that makes sense). I tried it with and without the Dijon and brought the Dijon back because it’s my go-to Brussels sprouts seasoning and really works well with the maple syrup as a base. I was a crispy M&M for Halloween. don’t talk to me about crispy m&Ms! I decided that peanut butter works with everything. Except for maybe pizza but even that, who knows! First of all, I was JUST telling someone about Crispy M&Ms on Tuesday (when I was pushing our magical candy cart around the office) and I was sad they’re not around anymore so I’m thrilled they’re making a comeback! Also, this is one of the most creative brussles sprouts recipes I’ve seen so I’m intrigued. I always loved the crispy and never knew why they left. But at least now they are back! I could see this being amazing along with roasted sweet potatoes! I agree about the traffic in our area, no wonder people are aggravated when you feel like you’re wasting your day away in the car! I’ve always said I hope to get out of this area at some point, but who knows, there is definitely a comfort with it too. I guess we find comfort in what we are used to —such as crazy traffic involving aggravated people…Definitely great with sweet potatoes, but isn’t everything?! You have done it again! This combo sounds absolutely amazing. Added sweet chili sauce to my grocery list. Thank you Thank you Thank you! Sara @ Lake Shore Runner recently posted…Friday Five: Happy Spring! Hahaha – I knew you would see the peanut butter part and like it! Definitely get the sweet chili sauce, it’s one of my faves. FYI – still no coconut oil, I was there this morning. I’ve never ever had crispy M&Ms, I don’t think! Exciting. And I could totally do the peanut butter and brussells sprouts combo. My kids might even eat them if there’s peanut butter in there! Let me know if your kids will eat it, my son will totally not touch it unless I pretend the Brussels sprouts aren’t Brussels sprouts. I live about 15 minutes from The Parlor and have eaten there! It’s a great restaurant with a lot of inventive dishes. The pizza is fantastic. I haven’t tried that Brussels Sprouts/Rice Krsipies dish but maybe I will next time I’m at the restaurant. You have to try the Brussels sprouts and report back for us!!!! I am not usually in that area but if you tell me it’s amazing, I am so there! Or I will just make it at home! Ok I will. 🙂 Also wanted to say I am a daily reader and love your blog. Thanks for the great writing! YES!!! The title of this recipe alone made me want to make it ASAP. I wouldn’t consider myself a nut butter addict, but this sounds sooo good. I wonder how it would be with other nut butters like cashew maybe? I love to mix nut butter with some other seasonings to put on sweet potato noodles to basically make a GF pad thai. I would have never thought to put it on brussel sprouts! I am sure this recipe would work with any nut butter! I’m not sure how I feel about this food combo. However, I am taking your word for it and definitely going to try it! My favorite M & M’s are a toss up between the pretzel, almond, and PB. Let’s just play it safe and say they all are my favorite…oops. I would not own a car if I lived in NYC. My brother works in the city and lives in NJ and when I visit him and we drive into the city I take back ever considering moving there. I just cannot deal with sitting in traffic doing nothing and feeling like my time is wasting away OR weaving through the crazy traffic and cars that think driving in the city is part of a high tech video game. It stresses me out to say the least, so props to you for dealing with it and rarely complaining about it! haha! I think it would be my topic sentence on the reg! My favorite way to prepare Brussels sprouts which I eat at least once a week, is to roast them with fresh squeezed lemon, fresh rosemary, garlic, EVOO, and sesame seeds. I also love them roasted in coconut oil and garlic salt. They are one of my favorite veggies for sure. Brussels sprouts are definitely my favorite! And I loved the peanut butter m&m’s too! And I hear ya on traffic. Podcasts and Audiobooks are the only things that have saved me. I wonder… if I just added the trader joe’s peanut dressing…….. plus peanut butter… dreams are being made righ tnow. That would totally work! I think you can play around with the ingredients – just adding peanut butter makes it all taste terrific! 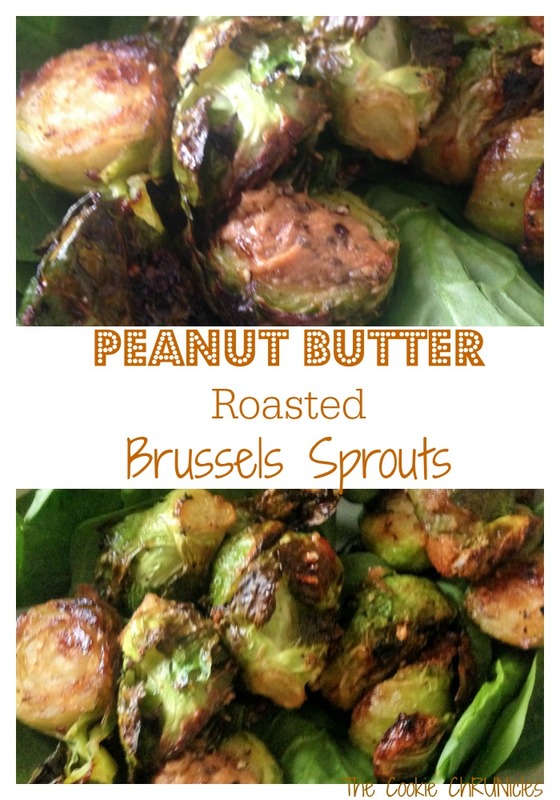 PB roasted sprouts?! Yes, please!! Love the crispy m&m’s, but the peanut butter was the best! No snow in MI today, thank freaking goodness. I was so sad when they got rid of crispy M&M’s! They won’t be the same though without the light blue bag. YEP- traffic and weather can be the worst. And things we can’t control. I totally forgot about crispy M&Ms! I don’t even remember what they tasted like! I’ll have to try them again now that they’re back. Peanut butter on anything is amazing (have you ever tried it on a burger? We have a place here that makes a special PB burger) I don’t love brussels sprouts but adding PB might just take them to a whole new level. 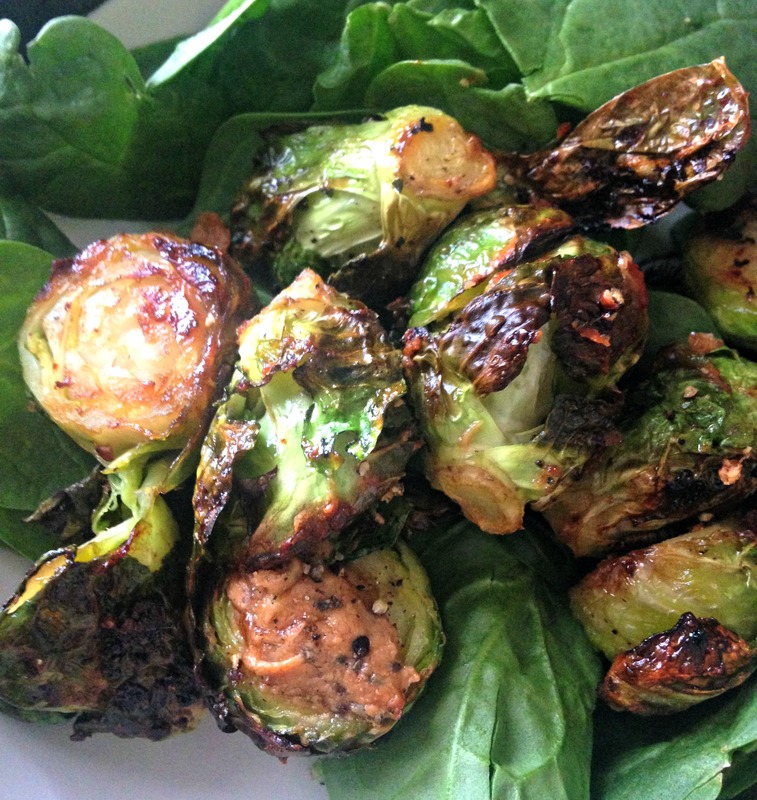 You need to love roasted Brussels sprouts. They are just too good and crispy not to. I haven’t had peanut butter on a burger since I stopped eating burgers a bunch of years ago now but I totally believe that it would be awesome! I make baby bok Choy with peanut butter ginger tamari sauce. It is wickedly good. The combinations are endless. I live in the city and the traffic never seems so bad when we drive around internally. It’s when we come back from westchester that I realize how getting into the city can be hellish but well worth it always. Have a great weekend. Sometimes it’s an easy ride and sometimes, it’s just awful! Sometimes I can fly up to Westchester so fast and then there are those rides where I swear I will never get in the car again lol. These actually sound super delicious. I used to hear about brussel sprouts as the WORST of all vegetables. I thought they would be gross until I tried them. 😀 And they were great! 🙂 Next time I get brussel sprouts this will be on my list. Emily recently posted…Body Obsessed? Addicted to Jesus! I love roasted Brussels sprouts — definitely my favorite right now and I see them popping up on all of the restaurant menus too!